I know I haven't posted much lately. After my awesome endo visit, you would think that things would be going great. That I should be happy. But the past couple weeks have been total crap. Before I go any further, I want to say that the past few days have been much better. Thanks to my husband, my friends, and my therapist, I am feeling much better. But things have been pretty rough. And I believe in being honest with you guys. So back to the crap. My fears about the binge eating monster proved themselves not to be unfounded. I've been in a rut. And the monster reared its ugly head once again. I'm learning a lot about myself as I'm going through therapy, both in talking with my therapist and journaling (per her suggestion). I'm realizing that there are behaviors and patterns that have been present in my life for years and years. And it's going to take a while to learn to do things differently. I don't like to deal with uncomfortable emotions. Fear, stress, anxiety, etc. My gut reaction to crave numbness. Apathy. To become detached. And food is how I try to get there. It doesn't work, of course. Rationally, I know this. But it's taking some time and effort to try to change my behavior. Some days go really well. I'm able to feel the uncomfortable emotions, and know that I am ok. That these emotions will pass and are not going to destroy me. Other days, not so much. The kicker is that when I most need to reach out, I withdraw. That's why I've been pretty absent lately. When things start to go south for me, I pull inward. I go to work, come home, watch TV, and eat. I don't interact with people. I stop tweeting. I stop blogging. It's something I'm aware of, and that I hope will be able to change at some point. Because I know the support is there when I need it. 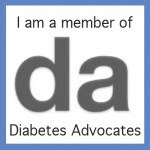 My family, my friends, and you, my Diabetes Online Community. I'm hopeful that next time I fall into a rut, I'll be able to reach out to someone. Because I know it will help. Monday night, I wrote in my journal, had a long talk with Josh, and a good cry. I started to feel better. Then I sent a tweet. Just the tip of the iceberg. A bit of an understatement, perhaps. I got some responses. And that helped more than I can say. Major thanks to Stacey, Rachel, Mike, Jacquie, Scott, Scott, Lawren, Kim, Kerri, Cherise, Andrea, Bob, and Lisa. Thank you so much. You have no idea how much your tweets helped me. I'm sorry I haven't been around lately. Responding to tweets, reading and commenting on blogs. I miss you guys. And I'm so happy that #FFL12 is next week. I need it. Badly. Thanks for the support, and thanks for understanding. I'm still here. Strong at the broken places. Even when you feel you're having a setback, you're growing and learning from it. I know it might not feel like that, but change is slow and hard to recognize in the amidst of it. I'm proud of the progress you're making. I'm here for you, always. Wow, Jess.. you just described exactly the things that I've been feeling lately with my therapy sessions, ruts and old bad habits. I'm looking forward to seeing you guys Monday and hang in there! You will continue to be in my thoughts in prayers. Have fun at FFL!! i just said to myself the other day "i haven't "seen" jess around much. hmmm" sorry to hear things have been crappy for you. virtual hugs until next week, friend! Hugs and wishes your way, Jess. Sorry to hear things have been crappy lately, but you're in my thoughts. Hope the therapy and journaling are helping tide you over until FFL fun gets your way. Well, Jess, I'm so glad that you're still here. Because if you weren't, there would be 84,901 DOC'ers (at last count) feeling sad. And nobody likes to be sad! So now that we're all happy, we're hoping you are happy too! sounds like FFL is coming at the perfect time. thanks for sharing your highs and lows (no pun intended) with such honesty here. I promise to keep checking in with you if you promise to keep checking in with me.